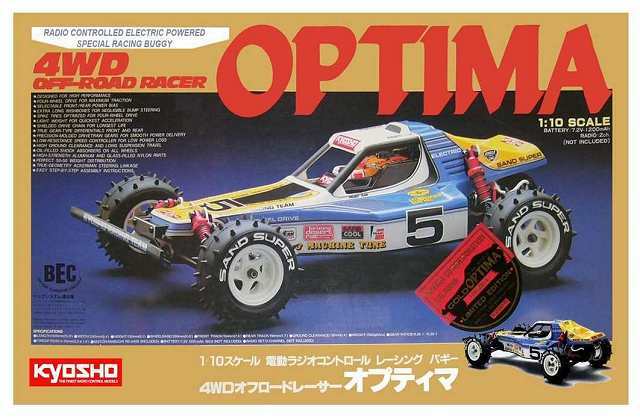 Kyosho Optima Gold - # 3032 • (Radio Controlled Model Archive) • RCScrapyard. 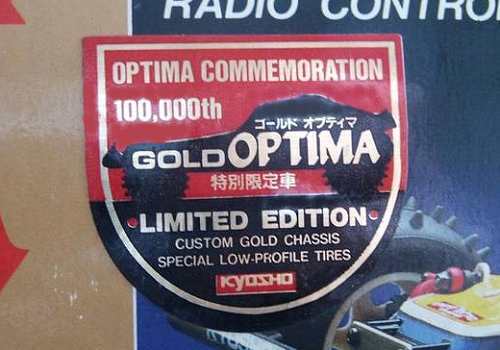 After the 100,000th Optima was sold, in late 1985, Kyosho released the 4WD Gold Optima - # 3032. A limited edition of 10,000 "Gold" models were made, with the same spec as the original, but with a number of gold anodised parts. The Model has a gold anodised alloy ladder-frame chassis and is chain driven, with gear type differentials, dogbone drive-shafts, coil spring over oil filled dampers, mechanical speed controller, 540 electric motor and bushing ring type bearings. To race the Kyosho Optima Gold, it requires a high level of tuning for improved stability when cornering, to keep it on the track and give you more grip under acceleration. Even the smallest change in your cars settings can make a Big difference. Our simple to follow instruction chart will show how to attain the best Set-up for your personal requirements. Buying a used Kyosho Optima Gold Electric Buggy, or any used RC Model, has a number of advantages. It is generally cheaper than new, ready built and may come with a variety of expensive hop-ups already installed. Cheap, pre-loved bargains are always becoming available. However, depending on the age of your purchase, it may need a little tender loving care before you can take it out on the back yard. The one thing you will always need is an instruction manual. If not supplied with your purchase, they can often be downloaded from the Kyosho website, or purchased separately on eBay. With an instruction manual, any problems with your model Buggy you may discover can easily be fixed. When you receive your used Kyosho Buggy, make a general visual inspection of the chassis, front and rear wishbones, suspension shock towers etc, for any broken parts that may need to be replaced. Then, take a screwdriver and box spanner and check each self tapping screw and nut for security, taking care not to over tighten. If the body shell of your Kyosho Optima Gold is broken, ripped or damaged in any way, this can be easily repaired with rubber solution glue. Also, for added protection and if available for your Optima Gold model, fit an under guard to stop dirt and gravel entering the chassis. If you intend to race your Optima Gold Buggy model at a competitive level, I would also recommend you obtain and fit titanium pivot shafts, turnbuckles, tie rods and steering rods. The Optima Gold steering servo is also prone to damage. In high speed crash situations, the fragile gear teeth of the servo can be broken off, rendering your expensive servo useless, so be sure to obtain a good quality "Servo Saver". Check out my Servo Information article. If body roll on your Kyosho Optima Gold is a problem, handling can be improved with the use of stabilizers, anti roll or sway bars, stiffer tuning springs and, or, thicker silicone oil in the dampers. If your used Kyosho Buggy comes with plastic and sintered brass bushings (ring type bearings), check the shafts that run in them for wear. Dust and grit can get into these bearings and abrade the shafts. Therefore, you should replace them all with shielded ball bearings. If the model has been run with ring type bearings, you may have to change all the axles and driveshafts. For more information, take a look at my article, How to get the best from your Bearings. Finally, good luck with your Optima Gold model and good racing. 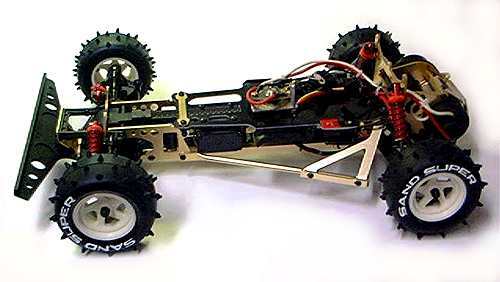 To allow the suspension on any RC model to do its work properly, it needs to ride in a position where it is able to react to any bumps and holes it may encounter on the track. Therefore, it needs to be adjusted to somewhere in-between those limits. That position is commonly termed "ground clearance" or "ride height" and is generally measured as the distance between the underside of the chassis and the ground, with the motor and battery etc installed. Simply speaking, determining the optimum ride height is dependent on the specific track conditions and "droop" setting (see my previous article). For Off Road models the rule is simple, the bigger the bumps and the deeper the holes, the higher the ride height. And for On Road, the lower the ride height, the better. For 1:10 Buggys I generally recommend a starting point for ride height at around 3/4 of an inch or 20mm. 1:10 Trucks and Truggys,1 1/4 inches or 30mm upwards, depending on the wheel diameter. For On Road models, somewhere around a 3/8 of an inch, or 5mm. Ride height doesn't just affect the way the car handles uneven track conditions, it also influences the way the car handles when cornering. For a stable car, body roll must be kept to a minimum and keeping the ride height low, is by far the best and easiest way to control it. Before you begin to set the ride height, it is best to make sure that each pair of shocks are exactly the same length, have the same spring type and same silicone oil weight. Also, if you don't have a ride height gauge of any kind, decide what height you want set your car to and prepare some kind of slip gauge to that dimension, a book, a pen, or anything that measures to what you want. I used an old square plastic servo mount, which was exactly 5mm for my touring car. It may be low tech, but it is just as accurate as any gauge you can buy. To set the ride height, the race ready car must be placed on a flat surface. Slide your slip gauge under the chassis and adjust the height by adding or removing tension to the damper springs. This is done on most models by using small C shaped clips, placed over the damper, above the springs, or via clamp type collars. On a number of top of the range models, this adjustment can be made by screwing a knurled nut on each threaded damper body. As a rule if the springs are compressed by more than 25% they should be replaced by stiffer springs. The gauge should just slide under the chassis on all four corners of the chassis. The Hydra-Drive, or Fluid Coupling design was actually designed in the 1950s, but only came to RC a couple of years after the introduction of the slipper clutch. In principle, the Hydra-Drive is supposed to give similar results to the slipper clutch but need less continuous adjustment. In practice, for me anyway, it was not easy to live with.